The Sonar reunion of 1999 is history. It went off without a hitch. Well, almost. Our capable reunion coordinators, Bob and Dyan Jacob, waited for everyone else to get their meals at our Saturday banquet, only to be informed that all the food had been served. They finally got theirs, but not until the rest of us enjoyed our meal. I guess that's the price you pay for being in charge! All those in attendance had a very good time. Our planned activities were well handled by Bob and Dyan. To me, the highlights were the bus trip out to the Texas Hill Country, which took us into the LBJ Ranch and the quaint little city of Fredericksburg, TX. This was especially enjoyable since we were able to tour the Chester Nimitz museum where we saw excellent displays of various parts of his marvelous Navy career. The WWII section was astounding. Adjoining the Nimitz museum was the George W. Bush museum and it too had a fantastic display of WWII stuff. Nestled between was the Japanese peace garden. Visiting the LBJ ranch took me back to the days of his presidency and the memories of many events at the ranch that I had seen on TV. The area is largely unchanged from those days. It truly is a very peaceful area. A must see for anyone visiting this part of Texas. Joining up together with my fellow sonarmen is always a special occasion. It's even better when I get a chance to meet up with a shipmate who served with me in the early days. Such was the case as I re-acquainted with shipmate Jim Wright, SO2, on the USS Blue (DD-744). Being a member of this fine group of people has allowed me to renew my friendships with so many of you. Thanks again. A final note to those of you who haven't attended a reunion, or for that matter are not now dues paying members, you are missing out. oin up and show up! See you at our next reunion! San Diego 2000. Looking back over the 13 or 14 reunions we have attended, this year has to rank among the tops. The weather was great, the accommodations were super, the programs were perfect. The golf courses and players were good. Bob and Dyan Jacobs did an outstanding job in making the arrangements and San Antonio proved to be a good selection. I like the Wednesday commencing time. It gives us golfers a full extra day to see and do things with the group. Not withstanding the two days of golf, the highlight was the entertaining tour to LBJ ranch, the Nimitz-Bush museums in Fredericksburg and the hill country. This was followed closely by our two group meetings, the patio BBQ, dinners as a group and certainly the banquet dinner and speaker. More members should be attending these fond memorable events and that should be our immediate goal. Making the reunions so bonding and fun-filled that no one would want to miss out. We are looking forward to next year's reunion in San Diego. 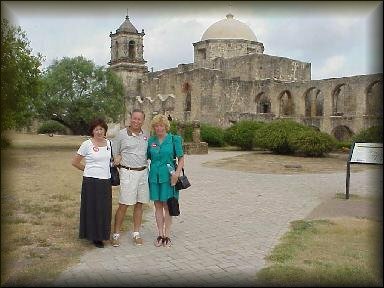 Fredericksburg, Nimitz Museum Doris Bedford and friends at the Mission San Jose. 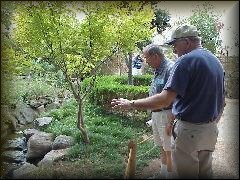 Bill Gray getting a lesson on Japanese Gardening from Jim Wright. 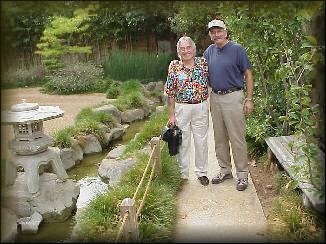 John Bedford and Jim Wright, shipmates reunited at the Japanese Peace Garden in the Nimitz Museum. 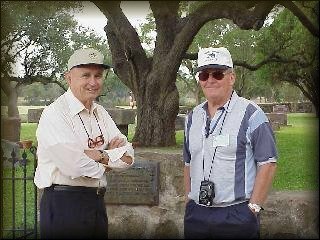 Bob Welch and Al Dunsmore at LBJ Ranch. 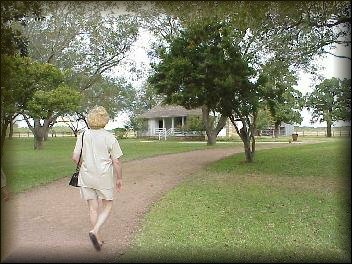 LBJ's birthplace at the LBJ Ranch.